Sigh… and with that one day’s events began records. Loads of records. Decade after decade of records. Wonderful, delightful, add-this-to-your-family-history records. Because the Post Office was a federal creation (it’s still national in scope even now that it’s been privatized as the U.S. Postal Service), its records are federal records, and that means — by and large — you’re looking at the National Archives. Lots of the records are on microfilm but few are available online. Did you have a family member who was a postmaster? 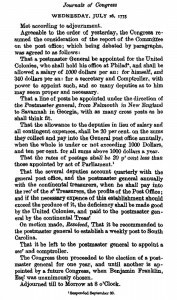 I did — my great granduncle Napoleon Bonaparte Johnson was the postmaster of Weatherford, Texas.4 His appointment records, and the records of other postmaster appointments, are in two sets of microfilm: M1131, Records of Appointment of Postmasters, Oct. 1789-1832; and M841, Record of Appointment of Postmasters, 1832-Sept. 30, 1971. Did you have a family member who served as a railway postal clerk between 1883 and 1902? There’s another set of microfilmed records for you — M2077, Indexes to Rosters of Railway Postal Clerks, ca. 1883-ca. 1902 — where you just might find your family member’s name and leads to other records. Did any member of your family serve as a substitute mail carrier between 1885 and 1903? Got another set of microfilmed records for you, then — M2076, Index and Registers of Substitute Mail Carriers in First- and Second-Class Post Offices, 1885-1903. You wouldn’t believe the list of towns included in this set of records, dozens of them ranging from Adams, Massachusetts, to Zanesville, Ohio. 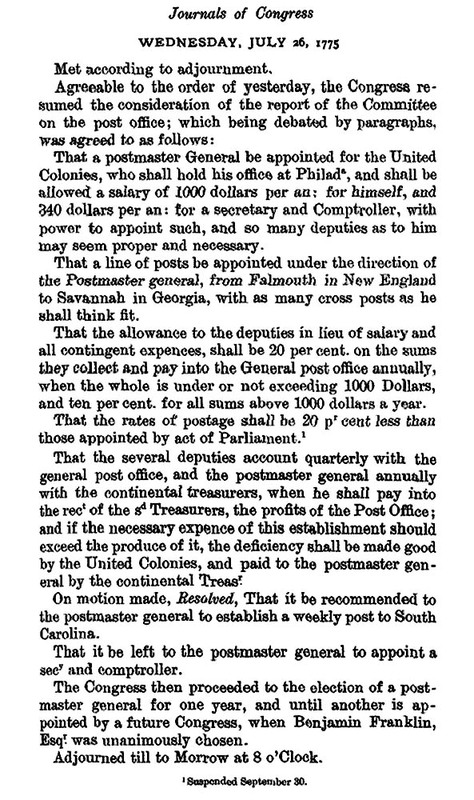 And you never know — maybe an ancestor of yours was discussed in Letters Sent By The Postmaster General, 1789 – 1836, microfilm publication M601. Thank heavens, there’s a Preliminary Inventory to guide us through the full scope of the records in Record Group 28. Preliminary Inventory No. 168 — the Preliminary Inventory of the Records of the Post Office Department, prepared in 1967 — has been revised by Forrest R. Holdcamper, and it’s available as a paperback on Amazon. Nothing on Postal Forwarding Addresses? The Spokane library has about 200 books on postal forwarding addresses from about 1907 to 1935 where the post office took apart city directories added 5 pages of lined paper and rebound the books in about an inch thick, on the lined paper they listed the name and address of where they forwarded mail and a date and a code (which we have no clue what the code means). So if John Smith moved to Seattle it may just list Seattle, Wn or sometimes a street address also. What a wonderful resource Spokane has! Nope, nothing like that on a national scale that I know of. Look at the comment by Charles Hansen, Bill — he says the Spokane library has that as a created resource for 1907-1935. I sure don’t know of any nationwde resource for change of address forms! My great-grandfather was a rural route mail carrier in Cobb County, Ga. until about 1940 and received a pension. Do you have suggestions on where to locate his pension file? Thank you. Love your blog – have learned so much from it! Thanks, Blanche! As far as I know, civilian pension records would still be with the US Office of Personnel Management (http://www.opm.gov/) but I’d definitely check that with the National Archives folks. This certainly won’t uncover everything that’s available at NARA, but I’ve found ancestors in books published by the post office that are available online. The Internet Archive (http://archive.org) has digitized almost 100 volumes published by the U.S. Post Office. The list of volumes available at Internet Archives can be found at http://archive.org/search.php?query=creator%3A%22United%20States%20Post%20Office%20Dept%22&page=1. There’s even a report to Congress (1901) about the feasibility of using a pneumatic tube service (!) in some major U.S. cities. Especially helpful for genealogists are the volumes titled “United States official postal guide: Table of post offices in the United States…” or “Lists (or Tables) of Post Offices in the United States.” These volumes not only identify the location of all post offices, but also name the current postmaster. Unfortunately, the year of publication isn’t always easy to determine from the Internet Archives catalog entry. Sometimes you need to “view the book” using the “read online” option to determine the year. Although it’s slightly easier to gather all of the related books into a list at a single url using the Internet Archives collection, there are advantages to checking at Google Books as well. Many of the same volumes are also available at Google Books and sometimes it’s easier to find the publication date here. But the real bonus is that a name search across all of the digitized books is so easy to do (http://books.google.com/). I found two ancestors listed as postmasters through a name search at Google Books even though I had no inkling that they might have worked for the Post Office. And anyone who’s comfortable using the U.S. Congressional Documents at the American Memory: Century of Lawmaking for a New Nation website (http://memory.loc.gov/ammem/amlaw/lawhome.html) can probably track down the information on a postmaster/ancestor’s appointment and confirmation. But the most interesting reading in these volumes from the Serial Set might be the petitions from states explaining why a new post office or new postal route is warranted. I learned about how frequently (or infrequently) the mail arrived at some remote locations where my ancestors lived. Many thanks to all for the suggestions. I have a lot of work to do!